Father of the deceased who demanded justice for his son, stated that the police authorities in the state were conspiring to shield the suspects. The death of two men, Emmanuel Nicks, aka, ‘Nisa and Abdullahi Maimatarba, in police custody over an alleged theft has sparked outrage in Yola, the Adamawa State capital. Nicks was allegedly buried by policemen to cover up his death. Family members were said to have learnt about the demise of the 24-year-old through the record at the state specialist hospital mortuary three days after his passage. Members of late Nicks’ family were said to have discovered that his corpse was deposited in the mortuary by the alleged killer cops. The father of the deceased, Kaino, who demanded justice for his son, stated that the police authorities in the state were conspiring to shield a police officer, Ahmed Suleiman and his accomplices, who allegedly deposited the corpse in the mortuary. He claimed that the police were attempting to frame three vigilante men, who were in police custody, for the crime. 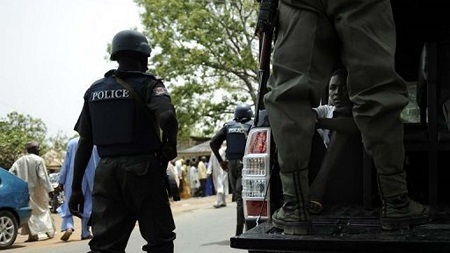 The men reportedly said they handed Emmanuel to the police alive after he was arrested with a jerry can of diesel near a telecommunication mast at Wurocheke, in Yola. The second victim of police killing, Maimatarba, a father of five, died at the state specialist hospital after he was reportedly brutalised by policemen. Maimatarba was arrested by the police at his residence at about 1am and taken to the Doubeli Police Station, according to his wife and mother, who spoke to journalists. The deceased’s mother, Hussaina Maimatarba claimed the police took her son to the intensive care unit of the state specialist hospital after he went into a coma. The report of Maimatarba’s death outraged some youths in Doubeli area, who protested over the incident on Monday. Chanting ‘one death too many,’ the protesters attempted to march on the Doubeli Police Station but were prevented by riot policemen and community leaders who prevailed on them. The Adamawa State Police command spokesman, SP Othman Abubakar, however, disputed claims that the force had buried Emmanuel’s remains.